Because the topics can be pretty basic, I’m not always in the mood to pen an entry. It takes a special kind of frustration to push me into this headspace. The kind of frustration you can only get from being a bloodsucking language pedant. As it happens, I engage with a lot of people every day. I listen to many people speak during lectures, seminars, or private meetings. I’m on the telephone or the cellophone having conversations. I read more now than I ever have before, whether that be novels, clickbait on Facebook, or articles about Magic. Normally, I don’t mind all these words whizzing past me. I get a little put off when someone grossly misuses a word (like saying “literally,” when they clearly mean figuratively). It might seem like a silly thing to waste my mental energy on, but hey, I’m only human. Even Achilles had flaws, but this isn’t going to turn into a self-deprecating Amy Schumer stand-up routine. It’s this demoralizing corner case that I find myself in so often when it comes to online exchanges, particularly about Magic. I need to constantly remind myself that everyone is coming from a different place, with different experiences. They may not be native English speakers, which would make Magic lingo a third language at best. What I should do, is take ten deep breaths and ask myself what would Buddha do. 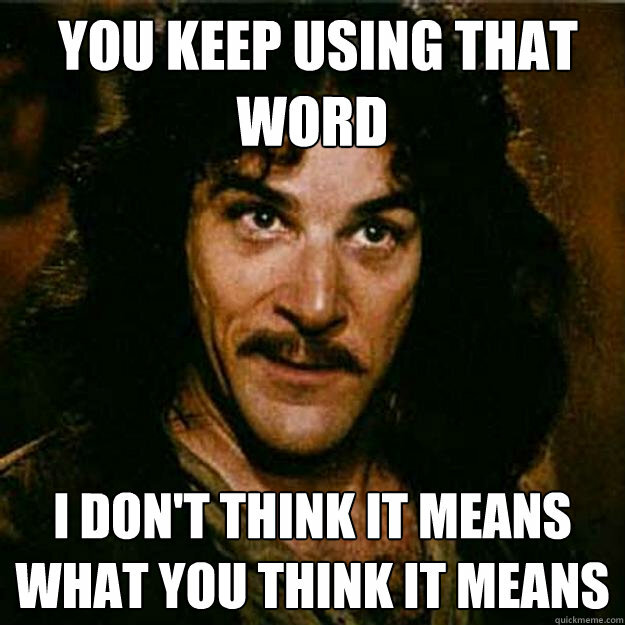 What I actually end up doing is getting in some poor person’s face and acting all Inigo Montoya. I’d like to expand on the first article by talking about a particular application of the word “strategy.” This article is going to focus on one of many deck archetypes. An archetype is a general strategy that is applied at the deck-level, meaning that these strategies aren’t unique to a single game, metagame, or format. A format that is overrun with Control decks could be described as “controlling,” “control dominated,” or “control-ish,” but the metagame itself is not the thing that’s indicative of Control. Rather, the decks that make it up are particularly, or perhaps, mostly controlling. Archetypes are the recurring types of decks that we often run into regardless of how we like to play Magic. Each different archetype is a family of similar decks. Each family tree has many different branches, which represent the different distinct categories within the family. Twigs break off for each different competitive Magic format, and the leaves in this metaphor would be individual decks. Since I mentioned Aggro decks in my previous article, it only seems fair to start there. Aggro decks seek to win the game quickly by deploying a flurry of early threats and overwhelming the opposition. The strength of this archetype lies in its speed. It offers only a narrow window for the opponent to clear the board or they’ll take lethal damage in just a few turns. This is an important distinction: Aggro decks almost exclusively win through dealing damage, not milling cards, or what have you. The weakness of this archetype is that it tends to be reliant on early game pressure. You’re all-in on one plan and you usually have no backup, because you can’t afford to hold anything back. If you stumble, or your opponent has timely answers, your chances of winning decrease dramatically. Aggro doesn’t just mean that you play creatures, even a lot of them, although you certainly might do that. You also wouldn’t use the word “aggro” if a player has simply curved out efficiently. Casting relevant spells on the first three turns doesn’t make you Aggro. Every deck should be built to play proactively and you should take full advantage of every turn you get. Also, Aggro isn’t the word to use if someone is playing aggressively, or if they’ve taken an aggressive line. In fact, “aggressive” and “aggro” get mixed up quite a bit in Magic jargon. Aggro, as we discussed, is a deck archetype. “Aggressive,” and its counterpart “conservative,” are mindsets or approaches that influence decision making behavior and help you assign weight to probabilistic evidence to support or reject a certain line. That was a load of hooplah, but the aggressive-conservative balance is a topic for an entirely different article (one that I’ll probably write soon). Probably. To further complicate this already confusing situation aggressive can also be used in a different sense on a totally different spectrum (there really should be a different word than this…like Aggro-ish). The line from “aggressive” to “controlling,” when describing the characteristics of a particular deck, could be a commentary on card choices, fundamental turn, threat density, or mana curve. If you’re unfamiliar with any of those words, they absolutely will be in future “No Uncertain Terms” articles, so stay tuned for that. Or ask a trusted adult. What Is In An Aggro deck? Aggro decks will typically have fewer lands than a slower deck, because they’re mostly casting cheap Creature spells. “Flooding,” or drawing too many lands and having too little action, is a common way that Aggro decks lose, so they often shave lands. Most Aggro decks contain around 33% land; they use those extra deck slots to include a higher density of cheap cards, often creatures or burn spells. Speaking of cheap creatures, about 50% of a typical aggro deck will be dedicated to creatures with converted mana cost three or less. Very few Aggro decks have creatures that cost more than three, and when these larger creatures are present, there are only a few copies in the deck. See my article, “Threat Density in Aggressive Decks,” for more on that. Some Aggro decks contain very few creatures, though, which could be a point of confusion. Decks like Burn or Izzet Blitz play fewer threats and more instants and sorceries (shout out to Travis Wizard, #WooBrews). What few spots remain are usually uniquely affected by the context that the deck exists in. Gods Willing saw play in recent Standard Heroic decks, for example. Aether Vial is often seen in Modern Slivers decks. And pump spells are used to grow your threats in an Infect deck. The simplest answer would be expensive spells. Cards that have a converted mana costs higher than six are simply too expensive to be playable in an Aggro deck. If you plan to end the game by turn five and never hit your sixth land drop, casting something big is out of the question. Cards that accelerate, or produce, extra mana are likewise not used. You also won’t see a board sweeper or any card that allows the opponent to gain life, these are antithetical to the core principles of an Aggro deck. Not all removal is bad, though; as mentioned before, burn spells play a key role in the archetype and other types of spot removal are often used in non-Red Aggro decks. Other types of answer cards–like counterspells, discard, and ‘tax’ effects–are not used in Aggro. This is a definitional line. If a deck has both an aggressive strategy and a significant disruptive component, we’d refer to that deck as an Aggro-Control deck, which is a completely separate archetype. That’s all for this week folks. As always your feedback is appreciated. Share some of your own favorite aggro lists in the comments below. Wherever knowledge goes, misinformation is sure to follow. Some topics can be confusing. Magic is a place where this is true more often than not. “No Uncertain Terms” is meant to give all players that same base of requisite knowledge to completely understand an issue; to give all Magic players, new and old, the language to communicate and fully understand each other. This series functions as a curriculum of vocabulary, with each new segment building on the last.